You are here : Home \\ Short Sale Articles \\ New Listing – Oakland HAFA Short Sale! 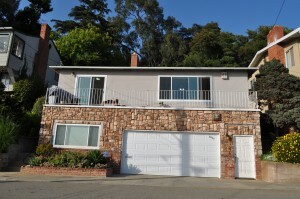 New Listing – Oakland HAFA Short Sale! East Bay Short Sale Group is proud to announce a new Oakland short sale listing located at 8922 Burr St. This is a Bank of America (BOA) HAFA short sale. This home has incredible panoramic views of the Bay, including San Francisco, Golden Gate and San Mateo bridges, Oakland Airport and more. Makes for incredible night views! This 3-story home has 3 bedrooms and 2.5 baths, and is 1985 spacious square feet. Very large garage with plenty of storage space and even has built-in plug for electric car charging! This Oakland short sale has had many updates throughout including newer roof, oakwood floors, newer kitchen cabinets and granite counters, stainless steel appliances, in-closet washer and dryer, pellet stove, and updated bathrooms. Home is in incredible ready to move in! Home also includes a jacuzzi off the master bedroom which needs a new motor but may be fixable! This home in Oakland is a HAFA short sale through Bank of America (BOA) , it is approved at the list price of $286,200 and will require Bank of America to give a final approval of the offer. The process to approve a buyer offer will take 3-5 weeks, then the buyer can begin to close on this HAFA short sale. If you have any questions regarding this Oakland short sale or how the process works, please contact us! We can describe how the HAFA Bank of America short sale process works and how you can purchase this property or a property like this. To see this property in person have your real estate agent contact the seller to make an appointment. If you do not have a real estate agent you may contact us to schedule a showing. We would be bappy to help so please contact us! Thanks for your interest in this Oakland HAFA Short Sale through Bank of America! Previous post: Another New San Ramon Short Sale Listing – Windemere Community! Next post: Bay Point Short Sale SOLD! Navigation: Weblog / Blog article: New Listing – Oakland HAFA Short Sale!